Orca whales, commonly referred to as killer whales, have made their home in the San Juan Islands for thousands of years. Historically, they have fed on the wild salmon that migrate past the islands although, recently, the relative shortage of salmon has forced the whales to increase their range to catch their meals. 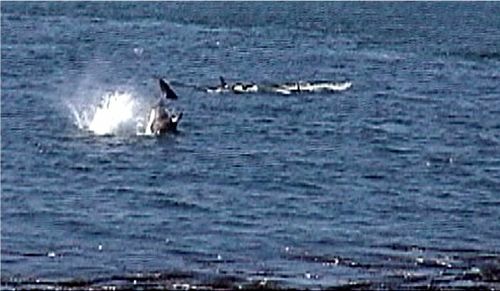 In the prime whale watching season throughout the summer in the San Juan Islands, Orca whales often pass by twice a day. Most of the time, the orcas simply swim by on their daily migratory pattern as they look for food. Sometimes, however, they circle around while they find fish, or they jump, or hang out right out in front of our place. Our pictures of orca (killer) whales are all taken from shore. Our gallery of the best killer whale photos that we've taken is shown below. Some of the photos that we think are the best include those of the whale family groups, particularly in 2003, as well as a sequence of a young killer whale breaching. We have pictures of killer whales alone or in their family groups (pods). However, all of these killer whale pics are fun to look at. To get an idea of size, the orca's dorsal fin is very prominent as it slices through the water; for orca males, the fin can be up to six feet tall. Over the last ten years, we've watched the US and Canadian whale watching fleet grow in size off the west coast of San Juan Island. Unfortunately, the number of boats now often outnumbers the number of killer whales that travel in front of our place. We think it's a shame that there are this many boats, particularly since there is evidence that the noise created from the engines on the whale watching boats is thought to threaten the whales' ability to use their sonar to locate food. It's just one more threat to their existence in addition to pollution and increasingly common food shortages from over-fishing of salmon in Puget Sound. The final photo was snapped in the summer of 2000. The whale is 'lobtailing' -- that is, slapping its tail on the water. Since all of our orca pictures were taken from shore, even though it does takes quite a bit of luck in terms of timing, it goes to show that you can get really good pictures without causing the potential harm to the whales by watching more closely from boats. Check out the reference to our pictures of killer whales at Orca Relief! This book that was listed as an Honorable Mention in the 2002 National Outdoor Book Awards. From the award citation: "Alexandra Morton makes a strong case for the orca's continued life on earth. She does this so remarkably well and in such an engaging style that you'll find yourself quickly drawn into the story of her life and research work with whales." The authors have been studying killer whales since the early 1970s. They present the latest information on killer whale natural history and suggestions on how, when, and where to best watch killer whales. From a discussion of orca evolution to an examination of their anatomical, physiological, and behavioral development, this book combines cultural and historical perspectives with biological facts. It discusses tribal identification with the orca, compares the intelligent whale to landlocked humans and wolves, and describes its hunting, mating, and communication talents. Includes 55 full-color photos. Informative and insightful, Hoyt tells of his personal introduction to orca whales. Twenty years later, this is still one of the best books on orca whales available. This body of water is one of the richest marine environments in the world. This book guides readers through this unique and spectacular ecosystem. Steve Yates' book features 180 full-color photographs. With a focus on transient killer whales, this book offers the latest information on their feeding habits, social lives, and distribution patterns. This book describes the natural history of killer whales. To get other useful background information on killer whales as well as to see some great photography, check out some of our favorite wildlife web links. Orcinus orca (killer whales) are the top predator in the marine ecosystem. With a 50MM year evolutionary run (compared to perhaps 3MM max for humans, if you stretch it), and with a brain considerably larger than ours in total neuron count and gross weight, Orca are perhaps the most social animals on the planet. Pods appear to be matriarchal in structure, and calves born into a pod never - that is, until a few weeks ago - leave it. You are born into a pod, and 40-80 years later, you die in that same small group (often 30-60) of whales. In most parts of the world, they travel non-stop in a transient lifestyle which includes eating almost everything else in the food chain, with marine mammals such as seals at the top of the list, and penguins not far behind. In one place - Puget Sound and the waters of the Inland Passage - Orca are known to be "resident," instead of transient (transient pods also come into these waters, but do not stay). That is, they spend at least half the year in a very confined space, eating what, until a few decades ago, seemed a limitless supply of salmon, and using the currents and islands to focus this hunt, just as native Americans did with fish traps, in their own time. One of the results of this evolutionary experiment with brain size, predation and time, has been the development of what is likely the most advanced sonic equipment on Earth. Orca sonar is an exquisitely powerful tool, able to detect, for instance, the difference between two identical cast aluminum cylinders at 150 yards, if one of them has a small cavity in its center.